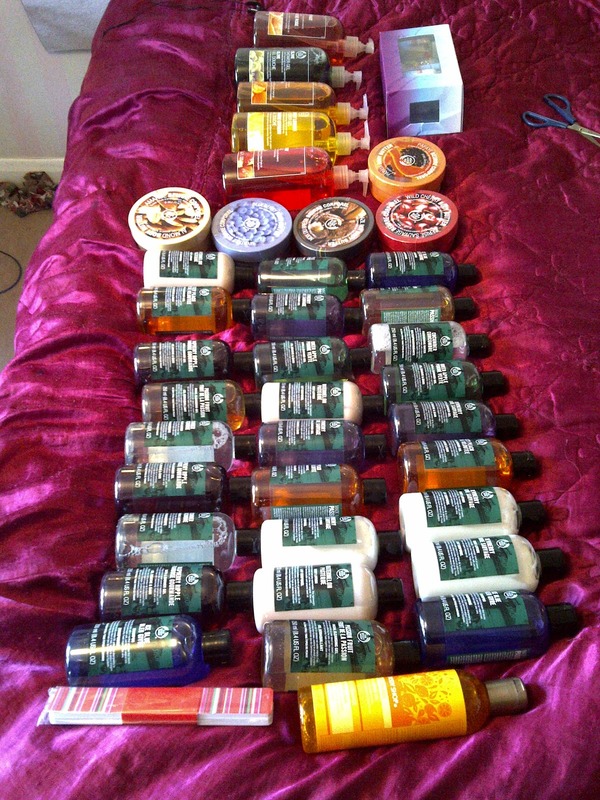 Fashion Kryptonite: Body Shop Giveaway! I am SO, SO, SO excited! I love the Body Shop products as you can probably tell from the image above! They just smell unbelievably good! As I have recently started up my blog, I thought I would share gifts with readers this Christmas! Each winner will win 2 items! Post a comment saying what you love most about Christmas! My Fav Body Shop products are Body Butters, Foundation and Loose powder, apart from their soft-soft makeup brushes... and i have been lusting after 'Lily Cole' collection from Body Shop. Hey Sangeetha! Thank you for entering! :) I love your blog! Hi Andeep. Thanks for the comment on my blog! I use a Canon SX500 IS. But I edit all the photos on iPhoto and Pixlr-o-matic too. hi what a great idea for the Chrismas givaway! I have never used body shop prodcts, but heard their body butter makes wonders - so i am very excited about winning! i love love love the body butters - nowhere else compares to the body shop for that! You're welcome! Thanks for entering and good luck! You're right the body butters are the best ! Is this giveaway international? I live in Spain! I hope it is because I absolutly love Body Shop!! I agree Christmas is such a magical time of the year! I can't wait for December now!! Thank you so much for entering! Good Luck! Great giveaway! Thankyou for your comment on my blog - follow back? I have followed you with GFC (as Lucy Roberts) and my favourite Body Shop product is the body butter because it is so much luxurious than a simple moisturiser and really makes skin feel wonderful! hi, thank u for stopping by my blog and lovely comment you left, it means a lot to me) Glad to meet you! Your blog is awesome!!! What do you say about following each other? I'm following you right now, hope you will do same! followed you :) love this, my favourite body shop product is the cocoa butter body butter, amazing! HI darlin! Just found your blog and am your newest follower on GFC #32! It would be great if you could check out my blog and follow back (if you'd like:)! Thanks:)! 1.of my parents who never forget to add things to my socks which I place near my bed side (I know I have pass the age of doing such things, however I love doing it). 2. Just thinking about Santa who will come with gifts and bless us make me smile (we do not have chimney in house, I know he don't need one, he can use our stairs). 3.Dressing up in Red and white to office and decorating X-mas tree and eating cake. I love the Oceania range at the Body Shop, especially the shower gel and perfume! My favourite Bodyshop products is the rainforest hair butter, everytime I use it , it drives my friends crazy, they just love the smell of it like me and ask me to use it daily :) and when my mom use it, whole day am I try to be as near to her as I can :) just in love with it's fragrance and the way it makes my hair shiny, healthy and soft. Also I would love to answer the second question also, I love the christmas spirit, the spirit to make other's happy, to celebrate the day with our family and friends and surprise them with gifts and the best part becoming a santa for someone, when I was young I often thought why santa gives present to unknown kids, then when I grep up I understood that life is all about sharing and caring, about helping each-other,and keeping the humanity alive.